About an hour after dinner last night, I was hungry—excuse me; that was a vast understatement: I was actually “hangry” (so hungry I was angry). Now, whether it was actual hunger or some serious boredom, I knew I needed to eat or else things were going to get ugly. But when I walked into the kitchen, I couldn’t help but feel an immense sense of guilt. Should I go for a third serving of dinner? I mean, it would have tasted great, but heck, three servings? No way. That was out of the question. Cheese and crackers? Too many calories. Night-time calories can go straight to the waistline. Then it hit me: air-popped popcorn. It’s a whole grain that’s rich in fiber and you can eat it for days without adding too many calories. Three cups of air-popped popcorn—which is quite a lot—comes in at about 93 calories. Whole grains are good for you—and although popcorn might not pack the nutritional punch of quinoa or other whole grains, or even come close to some fruit or veggies, it does a great job of filling you up without piling on empty calories. Three cups of popcorn offer 3.5 grams of heart-healthy fiber, which is a decent serving for 93 calories … and far more than you’ll get out of calorie-dense snack foods like chips or crackers. But if you’re not careful, snacking on popcorn can get dicey. 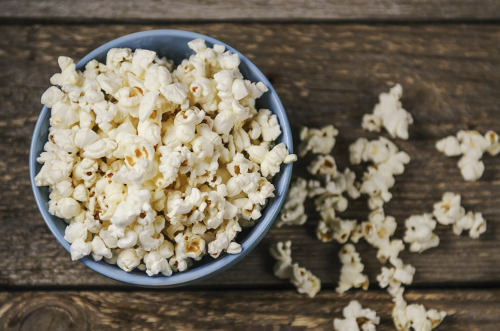 There are a few things you need to pay attention to in order to keep popcorn as healthy as possible. When you cover it in butter (or buy it pre-buttered), you add all kinds of calories and fat. The same goes for caramel corn and other varieties with sugar. Thankfully, you can add virtually any flavor of spice or herb (my favorite is dill) to plain popcorn to make it taste a little more interesting. There are so many spices and seasonings available that you can add a little something different every night of the week. By popping it yourself, you can be sure there are no additives. Popcorn can be your savior if you want it to be. When that nighttime hunger hits, calm it down with a few, healthy cups of popcorn.